This post brought to you by TownePlace Suites by Marriott®. The content and opinions expressed below are that of Growing Up Gabel. Spend more time having fun while on vacation, and less time trying to find what you need, with these travel organization tips for families. When I was in my early twenties I had the coolest job ever. I worked for a travel company selling and escorting tours in the Middle East. I traveled several times each year to places like Egypt, Jordan and Syria. I had a system down on how to pack for a 10 day trip in one rolling duffel bag and a back pack. I was a pro at staying organized. But my first trip with my daughter at the age of 4 months old for a weekend trip to New York threw out all my old systems. Holy cow did this kid need a lot of stuff! 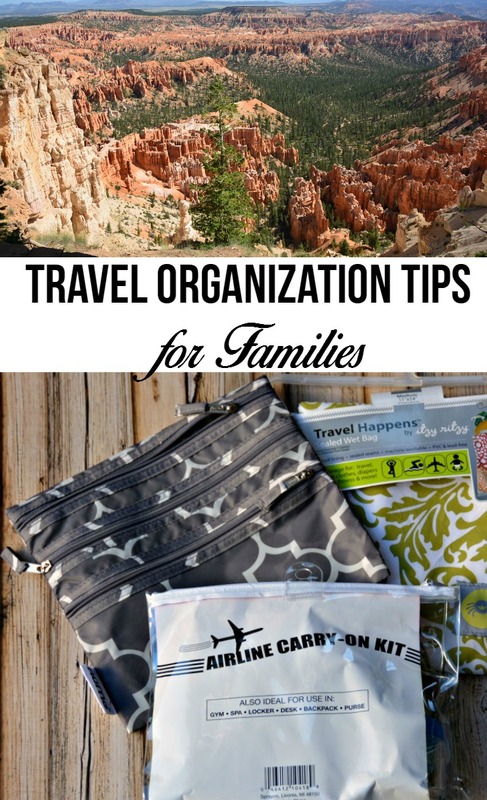 In the 8 years since I've found a few ways to stay organized when traveling as a family. Always pack a carry on with two days worth of necessities – I learned this lesson the hard way when I took my then 2 year old daughter back to Michigan to see family. I was alone and 6 months pregnant. Our flight misconnected and I ended up in Memphis for a night without any extra clothes, toiletries or enough diapers. This cool carry on set from The Container Store® is perfect to be able to carry all your necessities and still get through the TSA. Just don't forget toothbrushes. Book a hotel with extended stay features – When I traveled single, I rarely spent time in my hotel room. So it was quite a change to discover that with kids, you spend more time in a hotel room. My kids could just go to a hotel and spend a week. I personally like a hotel with an extra room for the kids, lots of closet space for our “stuff” and a kitchen or kitchenette for meals. I like our home base to have enough room to keep us organized. TownePlace Suites by Marriott® has all these plus a pool! In fact, TownePlace Suites® has partnered with The Container Store® to incorporate their elfa® closet system in to the rooms at 11 of their hotels. 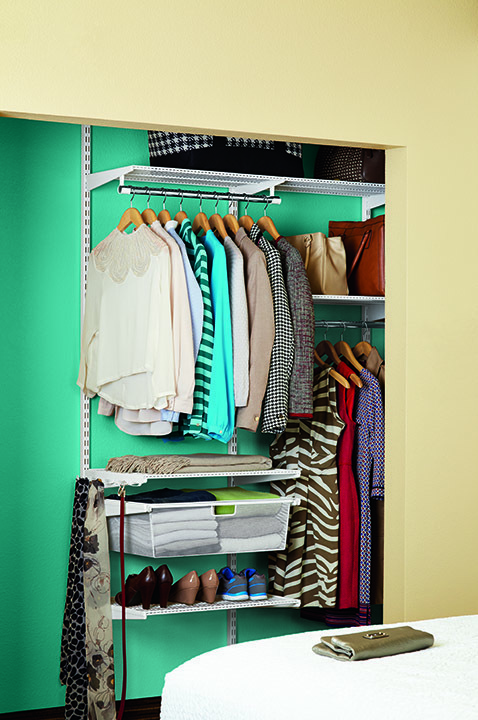 Look how organized you can be with that amazing closet! I love the shelves and drawers right in the closet to help keep clothes, shoes, and other kid gear organized. Unpack as soon as you arrive – I never ever unpacked my duffle bag when I traveled single, but now the first thing I do when we arrive at a hotel is unpack. Clothes are put in drawers or hung up. 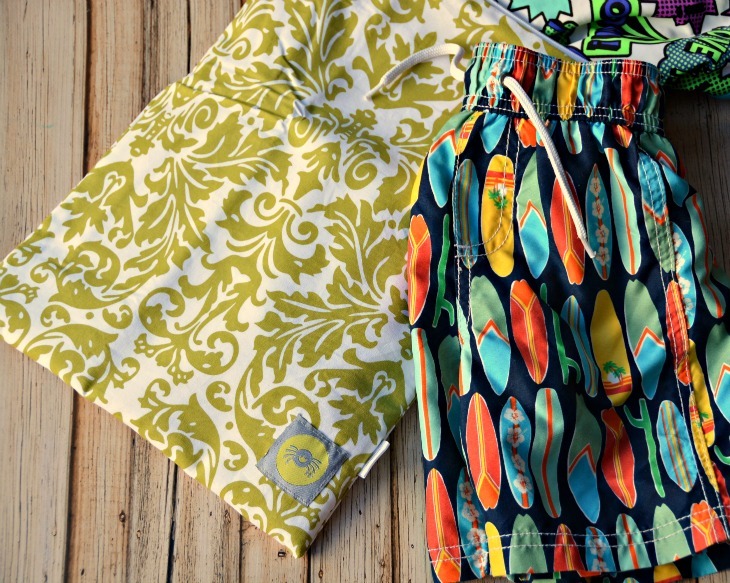 Swimming gear is given a priority spot for easy access for changing. Shoes are put in the closet so we don't lose them under furniture. This wet bag from The Container Store® is awesome for keeping wet bathing suits away from dry clothing so it goes with the swim gear. For longer stays, bring more of home – I noticed that my daughter starts to really miss home after about two days. So if we are going to be gone for longer than that, I tend to pack more items to make our hotel room feel homier. 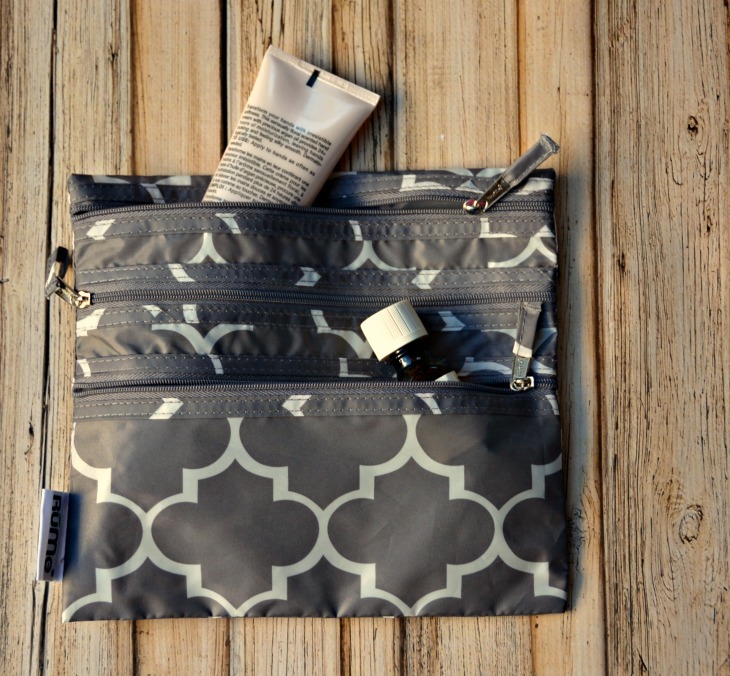 This zippered pouch is perfect for carrying things like essential oils, lotions, binkies, or other smaller items that help ease homesickness. I have found that these four simple tips have helped our family have better vacations. Instead of spending time searching for lost items, we know where everything is and enjoy more time having fun! Find out more about TownePlace Suites® on the TownePlace Suites® Facebook page! You must be 21+, U.S. residents only to enter. One (1) winner will be chosen. See official rules here. I stay organized by not over-packing. I take neutral color clothes that I can mix and match with different accessories. I also like to unpack as soon as I arrive so that my clothes don’t get as wrinkled. 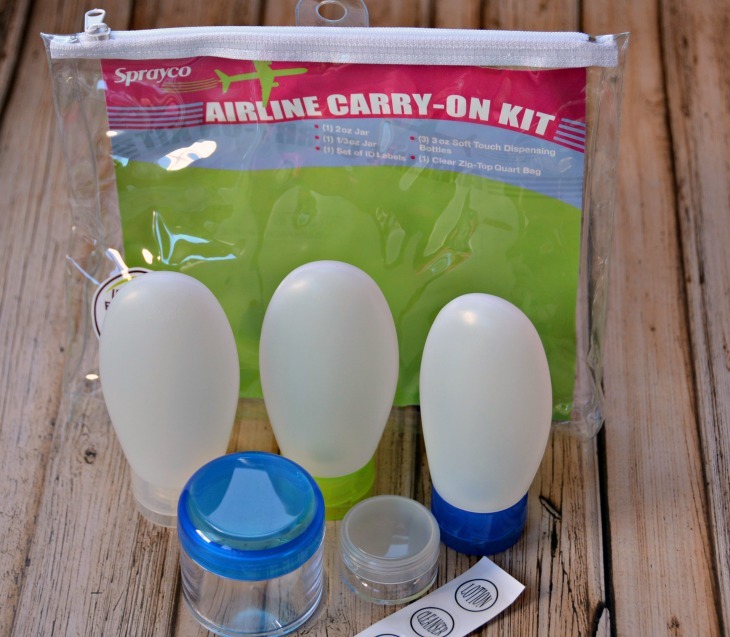 I like to use zip loc style bags to keep everything together inside the suitcases. Then I unpack everything when we arrive. I definitely prep like you do, keeping the shampoo/etc. in their own bag separate from the rest and in neat travel sizes. I don’t travel often but i always keep personal hygiene items in a separate bag and clothes organized by events/days. I bring extra things depending on weather. To stay organized, I pack clothing items I will need first on top. Another thing I find indispensable is a hanging organizer where I keep my makeup, hair products, etc. I can’t do without extra hangers and Ziploc bags, either. I make lists of all needed item for the trip. Then I pack any small items in baggies and any big items get rolled into my suitcase. I check the lists at least 3 times to make sure I have everything I need. A laundry bag is essential if you don’t want dirty clothes mixed up with clean ones! I use a hanging organizer also keep things together and accessible. I also keep essential items packed together, clothes I will need the first night get packed on top, etc. Shoes get wrapped in plastic grocery bags, but the shoe rack in the closet would sure come in handy! I stay organized by making lists before I pack and making sure I go over the list again when re-packing. I also put my items away neatly instead of just putting them around the room haphazardly. I stay organized by packing nice and neat, I roll my clothes to save room and time, use a good quality travel bag with lots of storage, and I also unpack as soon as I arrive to the hotel. We pack carefully and make sure things are organized in smaller cases. I lay out each outfit and it together (top, pants, socks, underwear) and secure it with a rubber band. I have small clear containers for each person that holds their outfits plus any other personal belongings. When we get to the hotel, we just put our clear plastic tubs on the luggage trolley! We usually have one other bag for food and one cooler for cold items. This works very well for us whether we are going to be staying in a hotel, camping, road tripping or even staying at grandma’s. To stay organized, everyone has their own suitcase & I always pack hangers to hang our clothes, & also pack bags for dirty clothes so I can keep them separated. I pack things that we can all use, like one shampoo, one toothpaste, etc. Too many things to take = too many things to keep organized! I am a firm believer in using Ziploc bags or travel bags to organize my items. I keep the items I will use the most together in one place and I put the clothes and other items I will need first packed on top. I put toiletries in plastic bottles so I don’t have to carry big containers. Sometimes I use sample sized products I get. I wrap shoes in plastic grocery bags and I carry a laundry bag with me! The shoe rack in the closet would come in handy! I try not to pack to much so I am able to find what I need in my suitcase. I sometimes don’t unpack at all on short trips, but I sure would if I had a closet like this! I pack lightly and unpack right when I arrive to the hotel!